Suicide Squad is one of the most anticipated movie adaptation slots from Playtech and you can join the gang of DC supervillains exclusively at Paddy Power Casino. Comic books are renowned for their heroic characters, but you'll also find loads of iconic villains that have been created over the years as well. While most stories feature superheroes that take down evildoers, sporadically even the bad guys get the opportunity to do some good. That's the story behind Suicide Squad, a highly-anticipated movie that was released in 2016 as part of the DC Extended Universe. Now, slot enthusiasts can indulge in the same story while playing the new Suicide Squad slot from Playtech casino software. With 5 reels and 50 non-adjustable paylines, players will be introduced to a phenomenal range of rough and tumble characters along with a remarkable selection of bonus features to keep them entertained. The bonus features include Suicide Squad Wilds, an Enchantress Mode, and four progressive jackpots up for grabs. The Suicide Squad dog tag will act as the wild symbol in the game, but unlike other wilds that appear as a separate symbol on the reels, these Suicide Squad wild symbols will only appear once you display a fully stacked Suicide Squad villain on any of the 5 reels. The number of Suicide Squad wild symbols you'll receive will greatly depend on the Suicide Squad villain you land on the reel set. For instance, you'll receive 2 Suicide Wild symbols when you land a fully stacked Katana or El Diablo, 3 Suicide Squad wild symbols when you land a fully stacked Joker, and 4 Suicide Squad wild symbols when you land a fully stacked Harley Quinn or Deadshot on the reels. These Suicide Squad wild symbols can stand in for any villain and with each subsequent spin, 1 Suicide Squad wild symbol will be removed from the reel set. The new Suicide Squad slot also features an incredible Enchantress Mode which is activated when you display a fully stacked Enchantress symbol on any of the 5 reels. Once triggered, the Enchantress will add 4 Enchantress wild symbols onto her reel and transform any Suicide Squad wild symbols into Enchantress wild symbols as well. In addition, the Enchantress wild symbols will double your winnings when forming part of a win. Similar to the Suicide Squad wild symbols, 1 Enchantress wild will be removed on every subsequent spin and the Enchantress Mode will end once all Enchantress wilds are removed from the reel set. What's even more impressive is that the new Suicide Squad slot from Playtech also comes equipped with 4 mystery progressive jackpots. The jackpot game is triggered at random on any given spin and once it's activated, you will need to choose between 20 jackpot icons that correspond with one of the four progressive jackpots. Each icon will feature a unique colour. You will need 2 green icons for the Mini Jackpot, 3 blue icons for the Minor Jackpot, 4 yellow icons for the Major Jackpot, and 5 red icons for the Grand Jackpot. The new Suicide Squad slot features five of the most popular DC supervillains from the movie, including Deadshot who pays the highest jackpot prize worth 250 coins, Harley Quinn, the Joker, Katana, and El Diablo. The other symbols include a golden cross, Harley Quinn's baseball bat and necklace, the Joker's razor blade, a pair of boomerangs, and Katana's mask and sword. When it comes to betting options, players will be pleased to know that the new Suicide Squad slot features plenty of flexibility, catering to both beginner and high roller alike. Although you can't adjust the 50 paylines, there are 20 different betting options at your disposal. You can start your reel-spinning adventure at a mere $0.50 per spin or enjoy the maximum bet amount of $500 per spin. 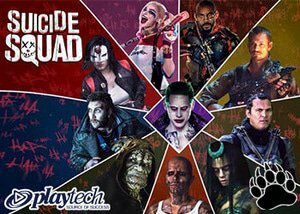 With a return to player ratio of 94%, the new Suicide Squad slot will soon be available at all Playtech casinos. In the meantime, you can play the new Suicide Squad slot at Paddy Power Casino where you'll be welcomed with a 100% match bonus up to a maximum of $100 along with a sensational range of banking options to easily fund your casino account.